Chechen President Ramzan Kadyrov signed a decree to rename the central street of the Grozny, the capital of Chechnya. The document renames Grozny’s Victory Avenue (Prospekt Pobedy) to Vladimir Putin’s Avenue. Kadyrov made the statement during a ceremony to open the reconstructed street. “It is impossible to overestimate Vladimir Putin’s role in the fate of relations between the peoples of Russia and Chechnya. Vladimir Putin has virtually saved the republic. The forces of the international terrorism from 51 countries of the world were defeated here, on the Chechen land, and Russia’s integrity was preserved owing to his support and understanding. As a token of our thankfulness, the Victory Avenue will now bear the name of the national leader, Vladimir Putin,” the press service of the Chechen president quoted Ramzan Kadyrov as saying. “As a Chechen national and as a Muslim, I herewith declare that I am ready, if necessary, to die for Vladimir Putin. We have come to this day, with peace in Chechnya, owing to this man,” the Chechen president added. Putin’s team showed a reserved reaction to Kadyrov’s initiative. “In general, it is not customary in Russia to name anything in honor of incumbent politicians,” the press secretary of the Russian prime minister, Dmitry Peskov, told The Kommersant newspaper. “However, federation units are entitled to make such decisions that are not subject to coordination with the Kremlin. Putin himself prefers not to see such initiatives and he has repeatedly expressed his point of view on that matter. He can not prohibit such initiatives either,” the official said. The length of Grozny’s former Victory Avenue reaches 1,300 meters. The avenue has been reconstructed in the style of the 1950s. The buildings lining the avenue are adorned with elements of the national Chechen ornament. The ground floors of the buildings are finished with natural stone, whereas the upper floors are adorned with cast-iron mouldings and modeling. Over 700 trees have been planted along the avenue. On October 5 Chechnya celebrated the 32nd birthday of its President, Ramzan Kadyrov, the day of Grozny and the 420th anniversary since establishing friendly relations between Russia and Chechnya. 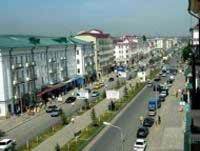 Grozny’s former Victory Avenue is one of the oldest streets in the city. The street was named Victory Avenue during the 1950s. An official from the city administration of Grozny told The Kommersant newspaper that it was Ramzan Kadyrov himself to have made the decision to rename the avenue in Putin’s honor. The reconstruction of the avenue required an investment of one billion rubles and the work of over 3,000 builders.